If you’re a football fan, you still have a week and a half before the Broncos and the Seahawks take the field in Super Bowl XLVIII. While you wait, take a moment to see how visual journalists are tackling the stories surrounding the lead up to the big game. 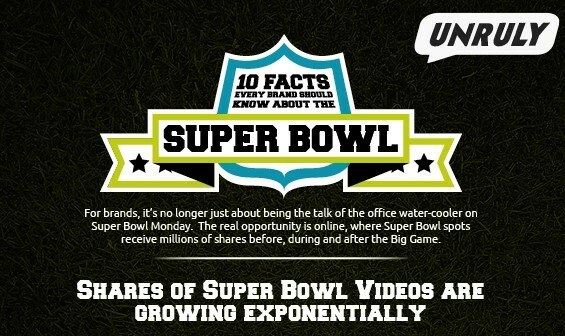 Online marketing technology company Unruly developed Super Bowl:10 Facts Every Brand Should Know that explores how big brands maximize the exposure of the ads they run in and around the Super Bowl. According to the infographic, advertisers are strategically releasing their ads online prior to the game, and maximizing “e-word of mouth” the day after the game and beyond. Last year, Budweiser’s Super Bowl commercial accumulated 15.6 million views and over 2.7 million online video shares in the days surrounding the Super Bowl. Now that’s a pretty impressive game plan! This entry was posted on Thursday, January 23rd, 2014 at 2:38 pm and is filed under INFOGRAPHICS. You can follow any responses to this entry through the RSS 2.0 feed. Both comments and pings are currently closed.